It's a rocket, it's a car, it has candy and needs better wheels! 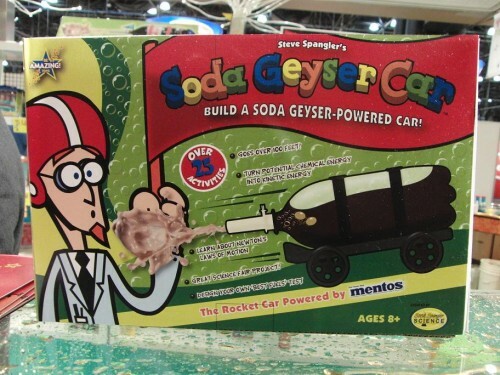 "The ROCKET CAR powered by Mentos"....? SO POWERFUL that the cartoon guy on the box NEEDS A HELMET?!?!? So of course I get this for the kids for Christmas and the first nice day we had here in New England in March we fired that puppy up. Me, being the media mogul that I am, put together this riveting nail-biting edge-of-your-seat video of the entire rocket car extravaganza. Maybe 'rocket car' was a bit of a stretch here to write on the box. I can't believe I bought this helmet for nothing. That is awesome! Maybe if you shook it up a little and got it angry then it might be a little more rocket like. But maybe not! What a let down! I um....yeah. Well at least you aren't a rocket scientist. You'd be out of a job. But you are a good dad and that's what really matters. That puppy isn't exactly going to break the sound barrier, is it? Great job putting the video together! 1) Our accent sounds wicked funny on camera. 2) Someone's making some money off 4 wheels and an industrial-sized tampon insert. 3) You can always force feed the whole 2-liter bottle of soda to your kid just before sending him back to his mother. Screw 'up to 100 feet;' he'll do five, six miles of laps around her living room, easy. At 10pm. ahahahaha. You gotta love marketing, god bless 'em. Not since I sent away for a gen-u-wine skyhook have I been so disappointed. You even had to give it a shove? C'mon Midge, give 'em hell. I expect to see a Facebook page soon, or at least and FAA, FCC, CPA, ASPCA I-Team Investigation! You're right though...total lack of climax. So the question remains...how can you rig it to make it insanely effective? Don't tell me you haven't thought about strapping a Co2 cartridge to that bottle & shooting it with a BB gun...because it's the first thing I considered!!! DO IT!